Adult stem cells are un-differentiated cells found throughout the body that divide and multiply to replenish dying cells and regenerate damaged tissue. Because they can develop into many of the different cell types needed by the body, such as heart, muscle, connective tissue or even brain, they are in fact the most powerful anti-aging mechanism known to science today. Rich in bioactive compounds like cytokines, interleukins, interferons, growth factors and peptides like praline rich polypeptides (PRP). Some of the growth factors include: human growth factor (HGH), insulin-like growth factors (IGF-1 and IGF-2), epidermal growth factor (EGF), fibroblast growth factor, platelet derived growth factor and granulocyte colony stimulating factor, which has been used as a drug to stimulate stem cell proliferation and activation. A powerful anti-oxidant that protects against premature aging, has an anti-coagulant effect, inhibits abnormal cell growth, normalizes blood pressure, blood sugar and cholesterol, improves stomach upsets and supports the immune function. Fucoidan also induces paid mobilization of stem cells in the body, with a significant increase in stem cells (CD34). Mimics the effects of calorie restriction, which is the only intervention proven to prolong maximum life span and produce anti-aging effects. Found to control weight gain, help prevent degenerative disease like Alzheimer’s and Parkinson’s and help fight against some cancers. Adult stem cells which circulate naturally in humans, are different from embryonic stem cells derived from an embryo. The most common stem cell is the CD34 which is created in the bone marrow and released to the circulation naturally when required for tissue repair. 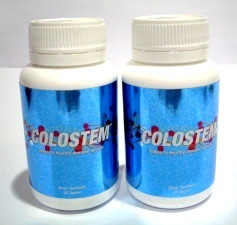 There have been many powerful testimonials from people suffering from various diseases who have recovered simply by taking Colostem® together with Alpha Lipid Lifeline colostrum. 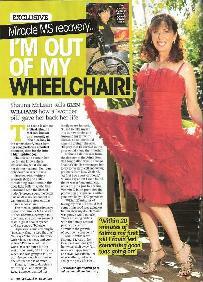 (See above: picture of Shauna McLean, who recovered from Multiple Sclerosis after taking this “wonder pill” as she calls (Women’s Day magazine). For testimonials of Shauna and others, visit the Adult Stem Cell Foundation. The Adult Stem Cell Foundation is a philanthropic not for profit Organization that endorses Colostem® as well as Alpha Lipid Lifeline. To share YOUR testimonial or ask a question on adult stem cell, click here. To return to view more products, click here.